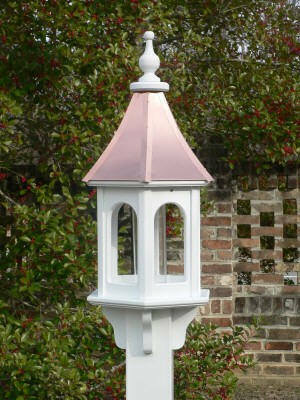 Bright Copper Roof White Vinyl Birdfeeder BC 10"
Copper Roof Classic White Vinyl Birdfeeder BC 10"
Copper Roof Classic PVC Birdfeeder BC 10"
This shiny bright copper roof gazebo bird feeder will not crack,rot,split or fade. Copper roof with protected finish. NOTE:Pole NOT included but the sleeve to mount the 4X4 post IS included. The sleeve is 4 inch sleeve that mounts on a 4 X 4 post.